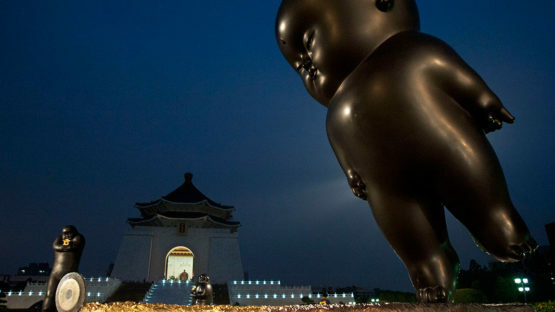 Li Chen is one of the most iconic contemporary Asian artist best known for variety of his Buddha sculptures. He is the most exciting and accomplished of the new generation of sculptors in Asia. His life and work are guided by his deep commitment to Buddhism. His powerfully modeled bronze figures contain references to classical Chinese sculpture but use contemporary concepts of modeling to express the realities of the modern world. Li begun his sculptor career in a somewhat simple way – He had encounter with a Buddhist who told him that he’d seen Chen’s realist paintings, and he thought they were quite good,advicing him to take a chance in sculpturing, imagine that,a Buddha statue. For Chen, in the beginning, it proved to be a more difficult endeavor than he imagined, but he decided to invest all of his time and energy into understanding everything that involves in the task at hand and so he did. While attending National Dajia Industrial Senior High School, Li studied arts and crafts and during his six years at junior and senior-high school was influenced by such important contemporary Taiwanese artists as Chen Hsin-wan, Cheng Chiung-ming, Lee Chin-hsiu and Huang Pu-ching. After completing his compulsory military service, Li Chen took up a position in the workshop of renowned local sculptor Hsieh Tung-liang where he studied body sculpture. Li Chen’s spiritual sculptures evoke the subtle skill of the textile weaver in supple, almost mylar balloon like textures, eliciting the soft within. He relies on the unique techniques of traditional Chinese ink lacquering together with gold and silver leaf, revealing a light and utterly relaxed sense, animating a miraculous contrast through its “heavy yet light” presence. Li Chen prominently gained international recognition when he was invited to the 52nd Venice Biennale International Art Exhibition in 2007 to become the first Asian artist to hold his own independent showing. In 2013, he held the largest independent exhibition in history at the Place de Vendome in Paris where he received coverage from international media. Currently, he works out of his studios in Taichung, Taiwan, and Shanghai, China.